A BUBBLING CAULDRON: STOP THE SALE OF THE FAIRGROUNDS! OK, folks, now's the time for ACTION! 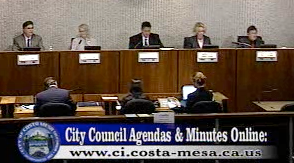 The Costa Mesa City Council and staff have given it their best shot. They've made two trips to Sacramento, meeting first with the General Services Department, then last Monday, with Governor Schwarzenegger, to have the sale of the Orange County Fair and Events Center quashed. No luck... Katrina Foley will return to Sacramento again next week to speak in favor of Jose Solorio's AB 1590, to cancel the sale. In the meantime, the clock keeps on ticking... On Friday, January 8th, all bids are due to be submitted to The State. They will be opened on January 14th and the auction to obtain the highest bid will commence. It's time for each of us to ramp up our efforts on this issue and communicate directly with the governor, requesting him to exercise his power to stop the sale. The best way to do that is by fax to the following number: 916-558-3160. If you choose to call, use: 916-445-2841. Tonight I sent my letter to the governor, thanking him for taking the time to meet with our leaders on Monday and respectfully requesting him to seriously consider using his authority as the governor to stop the sale of The Fairgrounds. I reminded him of the value of The Fairgrounds to our community and Orange County. I reminded him that it operates with a profit, requiring no state funds to keep it afloat. I reminded him of the overwhelming support being expressed by most Orange County cities and other elected bodies to stop the sale. I also reminded him that the zoning restrictions being placed on that site by the City of Costa Mesa will make it an undesirable location for any serious developer. It's time to let the governor know how you feel. Fax him or call him now. This may be the last chance you have to keep The Fairgrounds from being sold.